High quality martial arts training isn’t only for adults, kids can also enjoy the benefits of classes like boxing, kickboxing, Muay Thai, jiu jitsu and MMA. We have a special kids program here at Art of Eight where kids can learn self defense, fitness principles and prevent bullying. Our kids program includes one of the best programs for kids boxing in San Diego and MMA for kids. Our kids program is for children between the ages of 8 and 16 years old and offers a safe, fun and challenging environment. This program is taught by the same world class instructors as the adult classes and are built around safety, respect and education. The kids program enjoys the same top of the line facilities as the adult programs, but the areas are reserved specifically for the kids so there is no overlap. Each area is cleaned between classes to ensure maximum safety and health for the children. Some classes will take place on the padded mats where the principles and fundamentals of grappling will be introduced as part of the best San Diego MMA for kids program. Other classes will take place in the full sized boxing ring where the basics of boxing and kickboxing are taught as part of the premier program for kids boxing in San Diego, and others may also take place in our open area where kids will do basic physical fitness drills. Art of Eight features world class instructors who also specialize in children’s programs. We built the program around the principles of safety, fun, and fitness. Children will be taught basic self defense in the form of boxing, kickboxing, Muay Thai, jiu jitsu and MMA. These lessons will foster respect, communication and teamwork among their peers and their elders. The classes are all unique and will emphasize different arts, techniques and fitness drills. 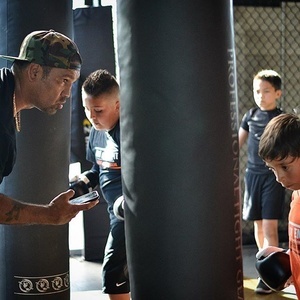 Being the best program for kids boxing in San Diego we will help them develop basic self defense skills and techniques as well as instill the basic principles of respect and fitness involved with boxing. As one of the premier San Diego MMA programs for kids, Art of Eight teaches discipline, confidence, building a positive self image, and above all, having fun! Studies have shown that children who participate in martial arts as an after-school program improve their study skills and increase mental focus. Our kids program goes far beyond fitness, it lays the foundation for a successful future. Warm Up. Calisthenics and Stretching to loosen up the muscles for exercise. Technique Training. Fundamental techniques for martial arts such as boxing, kickboxing, and kenpo. Partner Drills. Kids will be paired with fellow students to practice techniques on pads and bags. Cool Down & Games. The cooldown will involve technique based games such as boxing dodgeball and Simon says. They will finish the class with abs and strength exercises. Art of Eight is the premier training and fitness center for people of all ages. Our kids program is top notch and taught by the same world champion level instructors that teach the adults. By emphasizing fitness, confidence and self defense at an early age the kids we can help them develop into better, healthier adults. Finding an effective kids fitness and self defense program can be challenging but Art of Eight makes it easy. Try a free class today! ** We can make exceptions for individuals that are younger or older depending on specific circumstances. An individual training evaluation will be needed to see if your child is ready for the kids program.